Hey Matt. I’m stuck here: I got dEo2/douth1=-0.017144288. you got -0.019049. Can you check again? Thank you a lot! Didn’t get on lecture.Here is the best explanation! It can look like that in the pictures, however h1 is in fact from w1 and w2. The weight # is created based off of the hidden layer. For example h1 has w1 and w2 while h2 has w3 and w4. If we want to extend this to a batch of training samples, do we calculate the output layer errors simply by averaging the error at each output over the training samples, then obtain the total by summing the averages? Don’t we need to update b1 and b2? For really basic NN’s, it is not needed and can be left alone. Think of the biases as shifting your graph while the weights change the slope. If you wish to update the biases, simply do the same thing as the weights but don’t add the previous node as it is not attached to it. For example b2 is the same as w5, but without the hiddens (w5 would be h1) because it is not connected to any hiddens. b1 is the same as w1 but without the hidden stuff like h1(1-h1). Hope this helps, if not just leave another question. Sorry but I messed this up, the h1(1-h1) would be removed for b2 NOT b1, as b1 connects to hidden layer and the b2 does not. For b1 you would remove the input (i1) stuff. This is really amazing.thankyou for the clear explanation. Wonderful explaination!, btw how to reduce biases at input and hidden layer? Bravo Matt, la migliore spiegazione! Hey Matt, I’ve been trying to duplicate your results in a network I am building, and running into an issue. Using your examples as my test data, I have passed all tests except for the weight values in w6 and w7. My values are not matching. From a sniff test perspective, w6 appears it should be increasing since the output is lower than the expected (0.7 -> ~0.9) , but your calculation has the weight being reduced (0.45 -> ~0.41). With w7 your example has the weight increasing (0.5 -> ~0.51), but it appears it should be decreasing since the output is higher than expected (~0.7 -> 0.1). I know this is an older post, but if you could double check those values and let me know, that would help me a lot. Thank you Matt for your very good explanation! How do you create the figures of the basic structre, … etc. ? could the problem be solved linear programming ? I’m stuck at calculating w1. The procedure says to calculate dEtotal/dw1 we need dEo1/douth1, proceeds to use the chain rule, and substitutes 0.74136507 for dEo1/douto1. 0.74136507 was earlier given as the value of dEtotal/douto1. What am I missing? Why are the values the same? How is dEo2/douto1 calculated? Thanks in advance! I actually got it after a few repeat attempts. The key is, of course, in using the chain rule more to go deeper from d/dout to d/dnet. It’s then possible to calculate everything. I think neth1 will be 0,25*0,10, not 0,2*0,10, because w3=0,25. Am I wrong ? Excellent !!! realy great ! thx !! This was one of the best tutorials which helped me have a firm understanding of the dynamics of backpropagation algorithm in NN. Thanks man. Be blessed. But, is bias value need to be updated as weight? One question: in the explanation of the chain rule (the image) why is w6 connected to h2? w6 is connected to h1 in the image, right? Only w7 and w8 are connected to h2. That’s the best explanation I found since the first time I read about BP. Thanks! One of the best explanations I have seen. Thanks a lot, Matt! Why n=0.5? I couldn’t understand. Please help. Exellent post! 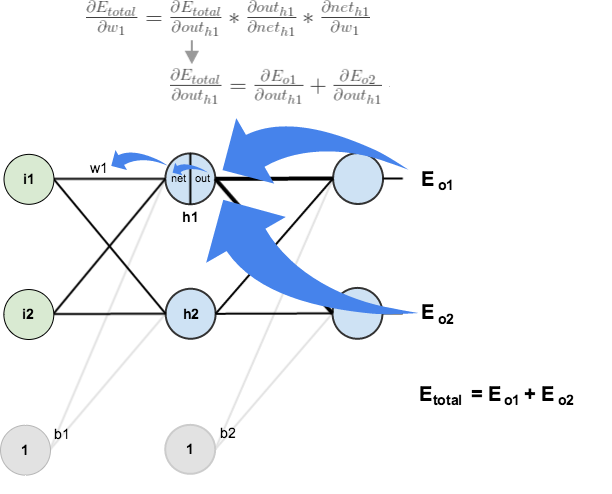 More complex mathematical bacground of backpropagation algorithm you can find in https://learn-neural-networks.com/backpropagation-algorithm/. This article is incredible awesome ! !